For diffuse populations of microbes living in well-stirred environments, life can be fairly relaxing. The depletion of food and accumulation of metabolic waste can be slow, and as a result there is little in the way of competition from neighbors. Cells within colonies, on the other hand, are in constant competition for the limited nutrients (things like sugar or oxygen) that can diffuse in from the outside environment. In order to understand how cells behave in these close quarters, CPLC researchers in the Zaida Luthey-Schulten Lab successfully coupled a sophisticated genome-scale model of bacterial metabolism with a reaction-diffusion model of nutrient transport throughout a growing E. coli colony of a million cells. This work recently appeared in BMC Systems Biology (http://www.biomedcentral.com/content/pdf/s12918-015-0155-1.pdf). 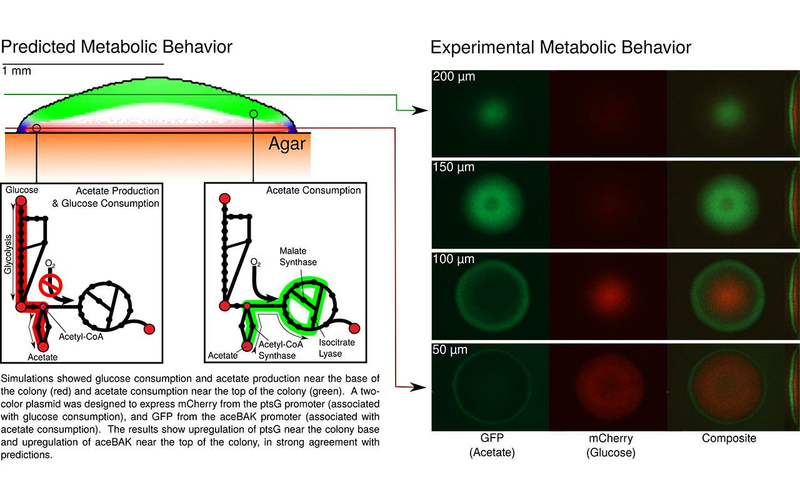 The researchers show that E. coli cells within a colony naturally differentiate into distinct metabolic phenotypes depending on their location. “Pioneer” cells at the outer edge engage in rapid growth that expands the colony, while dormant cells in the interior separate two spatially distinct subpopulations linked by a cooperative form of acetate crossfeeding (wherein one population makes acetate as a byproduct, and the other consumes it). Intriguingly, the closest known analogue of this crossfeeding actually occurs in certain types of cancer wherein cells on the inside and outside of the tumor have been observed crossfeeding lactate. With help from CPLC post-docs Jingye Fei and Ben Leslie, as well as microscopy specialists in the Core Facilities at the Carl Woese Institute of Genomic Biology, the researchers performed fluorescence imaging experiments that clearly indicated the existence of separate sugar-consuming and acetate-consuming subpopulations, strongly supporting their simulated results.